This visible image from NOAA's GOES-13 satellite was captured at 1815 UTC (2:15 p.m. EST), just 13 minutes after the 7.6 magnitude earthquake centered in southwestern Mexico's Oaxaca state. The image, created at NASA, shows a virtually cloud-free sky over that region. A satellite orbiting Earth snapped a clear view of Mexico from space today (March 20), just minutes after a major earthquake struck the country's southwestern region. The GOES-13 satellite image shows Mexico as it appeared at 2:15 p.m. EST (1815 GMT), only 13 minutes after a 7.4 magnitude earthquake struck the country, though initial reports set it at a 7.6 magnitude, according to the U.S. Geological Survey. The satellite photo of Mexico shows the country under a nearly cloudless sky, NASA officials said. "The epicenter of the quake was in the Oaxaca Region of Mexico," NASA spokesman Rob Gutro at the agency's Goddard Space Flight Center in Greenbelt, Md., wrote in a statement. "The epicenter was located 25 km (15 miles) east of Ometepec, Guerrero; 42 km (26 miles) north-northwest of Pinotepa Nacional, Oaxaca; and 186 km (115 miles) east of Acapulco, Guerrero, Mexico." The powerful quake set buildings swaying in Mexico's capital of Mexico City 200 miles away and was followed by a strong 5.1 magnitude aftershock, according to press reports. The earthquake's center was located about 12.4 miles (20 km) underground, according to a USGS update. Oaxaca is one of Mexico's 31 states and can be seen in the lower center of the GOES-13 photo with the Pacific Ocean below. The GOES-13 satellite is operated by the National Oceanic and Atmospheric Administration. 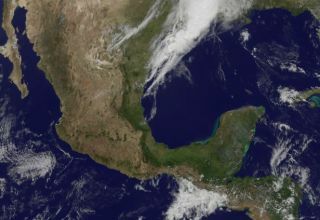 NASA's GOES Project at the Goddard Space Flight Center created the new photo of Mexico using the satellite's data.